Windows Vista and Windows 7 Start Menu contains a list of recently opened and frequently used programs (aka recent program list) which will be shown once Start button is clicked. Whenever users launch a program, Windows will keep track of this information and build a list of recently run applications on the fly, and rank them according how frequently the program has been accessed and used. This recently and frequently run programs list provides users with easy to access shortcut to quickly open and run a program without digging several levels deep into All Programs list. 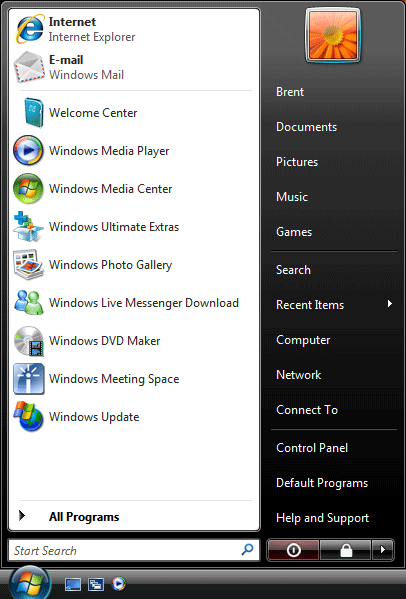 Typical Start Menu right after fresh installation of Windows Vista and Windows 7, with common programs such as Welcome Center, Windows Media Player, Windows Photo Gallery, Windows Live Messenger Download, Windows Media Center, Windows DVD Maker, Windows Ultimate Extras and etc. Windows does not provide an easy way to remove and clear the list though. You can remove an entry from the recently opened programs list by right clicking on the item, and select Remove from this list. For some reason such as privacy concern, want to wipe off programs usage trace, or want to replace the dynamic generated recently opened and frequently used programs list with the static user-defined pin list on top of Start Menu, you can clear and delete the history and cache of these records, or completely disable the recent program list by using following guide. Right click on the Taskbar or Start button, and select Properties. 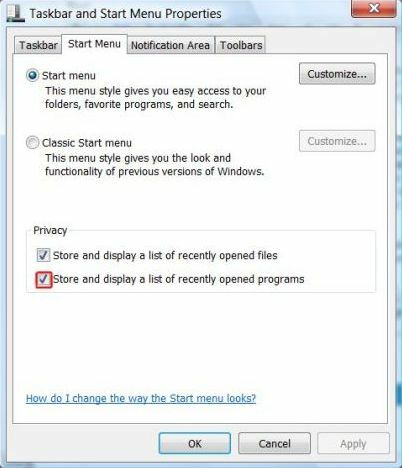 Ensure that you’re at Start Menu tab, else click on Start Menu tab. In the Privacy section, uncheck (untick) Store and display a list of recently opened programs setting. If you no longer the recently opened programs list to appear on Start Menu, click OK. If you simply want to clear the recent programs list to empty list, click Apply. Then check back (tick again) the Store and display a list of recently opened programs option, and click OK.